When it comes to designing a room, or space in your home, whether it’s your bedroom, kitchen or the family room, it can be a daunting, exciting, and, at times, a time-consuming project, with various stages involved. Before you get started with your redesign project, here are some ideas to help get the creative juices flowing! Deciding on a theme is a good base to start your plans for incorporating your dreams and designs into any space. Starting from scratch with a blank canvas means that regardless of what you may be planning, it will be easier to implement, as you do not have to worry about pre-existing color schemes or themes in the room. If you are in a position to start from scratch, creating mood boards can assist in the visualization process. This can be something which you can add to at any time and can be looked to for inspiration or shared with others when your interior design plans come to fruition. When looking into color schemes, using complementary colors means that visually, these will aesthetically tie together. You may find yourself needing to incorporate a color scheme with some colors that are already there within the space. Although this may feel restricting, it is still achievable. By doing online research, and perhaps purchasing some home design magazines, you will be able to get some inspiration and find something that works for you regardless. Getting inspired is easy enough, as many companies provide color swatches and examples of how to use certain colors. Implementing a color scheme into your home can also be in coordinated with fittings. Fittings can include sofas, carpets, mirrors, beds, and lampshades. By utilizing these features and linking to your overall theme subtly, you can complement any color scheme. It is also important to not go over the top and focus too much on achieving the perfect color scheme. Overdoing it can lead to an overwhelming space with too much color. Working to a scheme is about picking out key pieces that will naturally add to overall look. Spending some time deciding what you want to do with the space doesn’t hurt. It is best to have a clear idea of the direction you want to go in before you begin. It will prevent you from becoming distracted and going off course when you see a certain lamp you like the look of! Staying on track will be more achievable and feasible if you have given your ideas enough time and thought. After all, this space is going to be where you spend most of your time. Regardless of the theme and color scheme, find something that works for you. If you need some inspiration for ideal fittings for your new living room, for example, researching roman shade design ideas is a good place to start. Working toward a goal can make it an easier and more achievable process. Furnishings are less vital in terms of accentuating a color scheme, but this does not mean that they can be overlooked in any way. They are as important and can truly complement any space if the right furnishings are chosen. For example, if you are going for beachy vibes, and you own dark mahogany furnishings, this may not completely go with the theme. Sometimes it takes longer to find the appropriate furnishings. However, if these then become key pieces that add value to the look you are going for, the investment will be worth it. Making mood boards, and researching online can be a good idea. However, it is sometimes always best to have a look at an item in person before making an investment. This is especially important with furnishings that you will keep for many years, such as couches or a bed. Having a look in person and assessing the quality of the product will mean you avoid buying something you don’t like the look of when it arrives on delivery day. The fabric is important to consider as well; make sure it suits the scheme you are going for and is practical, too. One of the most frustrating things to updating a living space is finding the perfect item, but later on, discovering it doesn’t fit in the space. Take measurements throughout the room, including room length and width, as well as any corner spaces or nooks, and make a note of them. It will mean that wherever you end up, you will have the measurements on you, so you can work out there and then if a piece of furniture will fit well in your room. Do this early on to avoid future problems. Measure your window space as well, so that you can look into any window features that you need to add. In terms of coordination, as well as having an incorporated color scheme, it is also important to have an ongoing theme with the features in the space you are working with. For example, having soft edged furnishings mixed with stainless steel features would result in a mixed message in terms of the style you are going for. It is best to have a coordinating theme and set ideas regarding the kind of space you are looking to create. 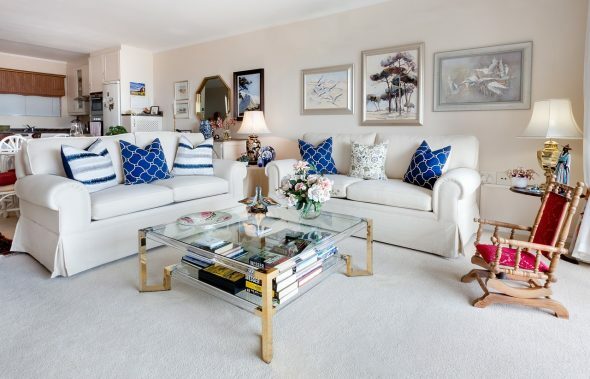 You could opt for a calming blue-hued oasis, with beach-themed features such as driftwood coffee tables, or more natural space with green tones, with the incorporation of lush green plants to accentuate the color scheme. Perhaps cooler grays, whites, and exposed brushed steel is the look you are going for. Whatever you decide to pursue, it’s important to keep this in mind while you go about redecorating and furnishing. Of course, it is up to you what you decide to bring into your home but keeping in mind the overall look of the room can avoid any unnecessary clashes. Setting a budget to ensure that you don’t get carried away can be hugely beneficial. By outlining in the first place exactly what it is you are setting out to achieve, you will be able to grasp an understanding of what can be spent where. Suddenly that hard decision about what to buy is made for you, as one fits into your budget. Thinking about these factors before you begin will ensure you don’t have to compromise on your perfect space. When it comes to interior design, space doesn’t have to be a limitation. Depending on what you want from your space, you may find that you feel restricted about what you can do. However, space-saving items to have in the home have long been the solution. A sofa bed can turn an office into a spare room, and a fold down table can give you the perfect dinner table in a restricted space. Look for functional and dynamic pieces, that benefit your needs and make the space work for you. Putting into place the final touches can be the most fun part of any interior design job. Deciding what to put where is like a reward for all the hard work. Window shopping is now possible, as you can look into purchasing mirrors, shelves, photo frames and candles to truly make your space cozy, homely and most importantly, yours. It is easy to go over the top at this point. Again, keep in mind the space you are working with, and what works best where. If you are remodeling the kitchen, additional touches such as tea-towels and placemats can be cleverly used to hint at the color scheme. If you are fortunate to have a space with lots of natural light, make sure you maximize this and use this to your advantage. Bringing in natural light will brighten any room. This could be an extension of a natural theme that you have incorporated indoors. Skylights are also a brilliant way to bring in natural light. A window seat is another unique feature that you could add to a space. The walls are a fantastic canvas. It is a good idea to mix and match and vary what you do with the wall space available. Painting four walls the same color can leave your room looking a little bland. You could instead have a feature wall, with patterned wallpaper. Another wall could provide a subtle backdrop for a collection of photographs, shelves, or art prints. Your walls are a place to express yourself, and if you can, utilize them. Although thinking practically may not seem a fun option, it is important to consider for certain parts of your home. For example, in your hallway, it may be worth investing in a side table, for your keys, or a few hooks for your coat and keys. A bookcase can be useful in a bedroom to display sentimental items as well as books, and under-bed storage may also be worth investing in. Once you have completed your project, you can sit back and relax. But it’s important to maintain the space as a calming, comfortable environment. A few months in, it may end up looking messy and disorganized. Set a certain amount of time aside each week to tidy up and give the space a clean and a spruce up. Maybe purchase some flowers to display or update the photographs every six months.